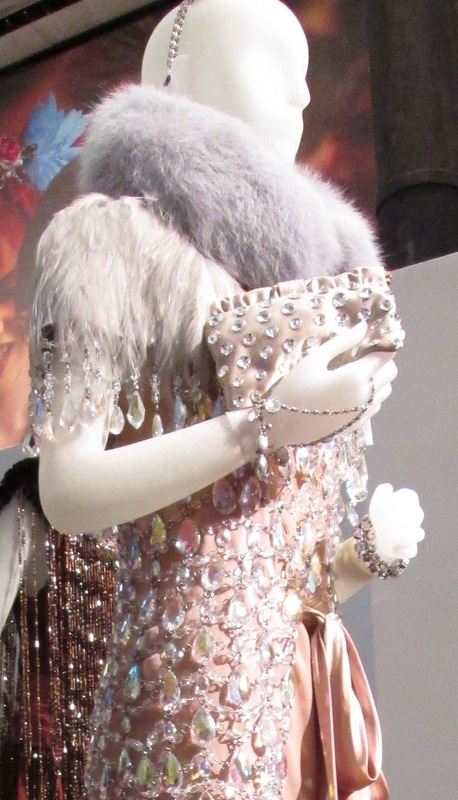 Costumes for The Great Gatsby by Miuccia Prada. The center dress was worn by Carey Mulligan. From May 1-12 a treasure trove of costumes from The Great Gatsby were on display at the Prada store in Soho in Manhattan. 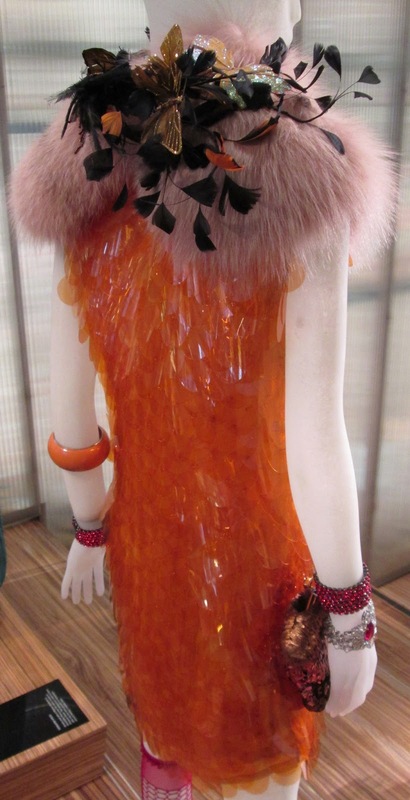 These costumes were made by Prada in collaboration with Catherine Martin, the costume designer on the film. I could not get over how many there were, and how beautiful they are. With the exception of the dress Carey Mulligan as Daisy Buchanan wears in the scene where she attends one of Gatsby’s parties, the rest were made for the extras! Hey Mom, this picture is for you! It was sequins, rhinestones, paillettes, and bugle bead fringing as far as the eye could see and I was in heaven. I have had the sales staff and security guards at Prada tell me I can’t take pictures in the store so I was ready to hear “No” when I asked if I could take some at this exhibit, but that was not the case this time and I shot to my heart’s content. I’m sure the security guy thought I was a nutty nut because let me tell you I went through every tier of that display and took picture after picture. You know me, I never get tired of sequins! Luckily it was a rainy weekday and I had the place to myself. Otherwise, the sales associate said, it was packed on the weekends. This is so not what was being worn in the 1920s but who cares? This is Fitzgerald’s novel through the lense of Baz Luhrmann. His Oscar-winning costume designer wife Catherine, in combination with Miuccia Prada, made costumes dense with unexpected and glorious details so I can’t help being charmed by their creations. I spotted this orange paillette dress in the film. Did you? This dress was one of my favorites. I love the straps on the shoes! The exhibit will be shown in Shanghai next, followed by Tokyo. I’m sure it will be a big hit there as well. If you saw The Great Gatsby, what did you think of it? I predict Oscars for Production Design, Costume Design, and Makeup and Hairstyling. I haven't seen it yet as I'm waiting for my husband to return from Japan so we can see it together. After seeing these images I really want to go. I had heard so many mixed reviews about the film. Thanks for sharing the photos. So great to have the opportunity to see them up close. Wow, those are *stunning* costumes! Thanks for taking all of these pictures and sharing with us. Such beautiful gowns and how lucky to be "allowed" to snap so many photos. The one with all the crystals must have weighed a ton! Great Scots, woman! What a privilege to be able to see all of these gorgeous costumes. Were you allowed to go up and down those steps for a closer look? If I had been there it would have been deemed too risky by management to allow me to do so...on account of all the drooling and all. To have lived in an era where women dressed this way...whoa! Thanks for the photos! Just, WOW! I can't wait to see the movie!! I loved the movie, although I want to see it again in 3D. You are so lucky to have seen all these costumes "in the flesh" and your pictures are very beautiful. Thank you ! Thank you for the beautiful pictures! Heaven! The details of the dresses are exquisite. I loved Baz's take on the novel. I agree that a straight version of the book just doesn't translate well to screen (obviously a common problem for adaptations), which is why I actually don't mind a little creative interpretation through visuals. I do hope Gatsby takes home some Oscars, because it was just a wonderful spectacle to watch on screen.